We already mentioned that the Shuttle program would soon be over. In 2006, NASA announced the next manned spacecraft. 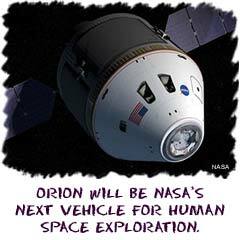 The capsule-like craft will be called Orion. I will be used for missions to the Moon and Mars. The development of the new vehicle will be managed from the Johnson Space Center in Florida and their Constellation Program team. What is Orion? If you see a picture, you might think it looks a lot like older orbiters that were used to go to the Moon in the 60s and 70s. While the shape looks similar, it will be an advanced spacecraft with the newest technology (and over twice as big). Between now and the proposed launch in 2014, NASA will be developing new systems and tests to make sure the spacecraft is safe and capable of completing any assignment. The new vehicle will be able to carry up to six crew members to the International Space Station and four for missions to the Moon. Although still being developed, engineers hope to use the vehicle to transport crews to a different spacecraft on missions to Mars. Although a recognizable shape, Orion's design is based on known physics. There are specific shapes that are ideal when you are sitting on top of a rocket or falling through the atmosphere. The conical shape allows for a safe and reliable mission. The capsule will be about 16 feet wide and weigh about 25 tons. The Constellation Program managers are also in charge of developing the launch vehicles that will take this large capsule into orbit and space. The Ares rockets will be used as both launching rockets and boosters. 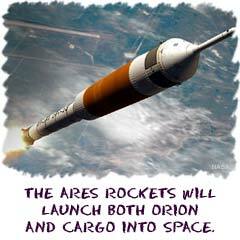 The Ares I rocket will launch the Orion vehicle into space. The Ares V will be a larger rocket designed to take heavy cargo loads into space. Once cargo is in orbit, it can be transported to the Moon or Mars (in the future).